Viral infections are common and can range from the common cold to more serious diseases that cause millions of people to die at a premature age each and every year. The group of infectious diseases classified as Hepatitis are an example of more serious viral infections. There are different types of Hepatitis viral infections. Some of these diseases can cause deadly complications, while others are easier to identify and treat, leading to a lower risk of life-threatening health ailments down the road. Hepatitis C is considered to be the most common type of Hepatitis and affects millions of people throughout the entire world. In this post, we will take a closer look at what exactly Hepatitis C is, what causes the viral infection, and how it defers from other Hepatitis diseases. We will also consider how the disease is diagnosed and what type of treatment methods may be used to reduce the risk of developing severe liver diseases as a complication. Hepatitis C is part of the Hepatitis viral infectious disease family. The disease often remains asymptomatic in patients. Patients often realize that they have been infected with the virus once they start to experience symptoms caused by the complications that the viral infection leads to. The disease is estimated to affect up to 200 million patients worldwide, accounting for approximately 3% of the global human population. It is also estimated that around 350,000 people die on a yearly basis due to the liver diseases that the Hepatitis C infection causes as a complication. Where Are Hepatitis C Most Common? This infectious viral disease is more common in some areas of the world. The regions where the disease is found are often divided into three categories: low-risk, intermediate-risk, and high-risk. Travellers should ensure they identify the risk factor associated with a country they plan on visiting prior to their travels. When they are at risk of catching the virus, precautionary steps should be taken before they visit their travel destination. Even though this disease shared a similar name as others, particularly Hepatitis A and Hepatitis B, it should be noted that there are several differences between these diseases. At the same time, however, similarities can also be found. This is why many people may easily become confused regarding the signs, causes, transmission, treatment, and prevention of these viral infections. Similarities between these diseases would primarily include their symptoms. All types of Hepatitis viral infections may cause a patient to experience a fever, fatigue, joint pain, diarrhea, abdominal pain, dark urine, a loss of appetite, and nausea. All Hepatitis diseases also affect the liver and cause inflammation of the liver to develop. One of the primary differences between Hepatitis C and the other two types of the disease is the fact that no vaccine has been presented against Hepatitis C. There are vaccines available that can help to prevent Hepatitis A and B. Another important difference is that Hepatitis C becomes chronic in up to 85% of adults infected with the virus. With Hepatitis A, chronic infection is not possible, and only about 5% of people who acquire the Hepatitis B infection will go on to develop the chronic type of the disease. Other symptoms may occur in certain patients as well. If a patient develops symptoms, they are likely to be very mild – sometimes unnoticeable. Jaundice may also develop in acute Hepatitis C, which may cause the eyes to become a yellowish-color. How Many People Develop Chronic Hepatitis C? When a person is exposed to the virus that causes Hepatitis C and goes on to develop the infectious disease, they will first experience an acute phase of the condition. Between 15% and 25% of people who are affected by acute Hepatitis C will able to experience a full recovery as their bodies will eliminate the disease from their system before it can become chronic. Unfortunately, the majority of patients who develop acute Hepatitis C (up to 85%) will go on to develop the chronic form, which means the virus will be present in their bodies for the rest of their lives. 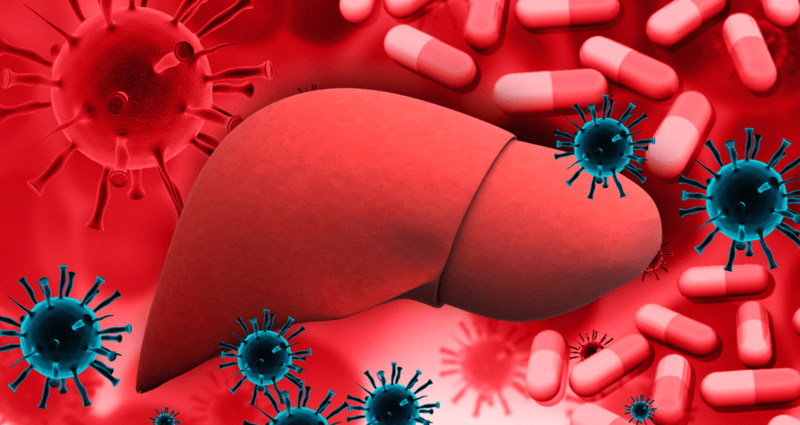 Can Hepatitis C Kill A Person? Worldwide, an average of 350,000 patients with Hepatitis C dies each year – because of the disease. What many people fail to realize is that the virus itself is not what causes a patient to die, but rather the complications that the virus causes. Hepatitis C causes the liver to become inflamed and gradually damages the patient’s liver over time. In turn, this eventually leads to the development of liver diseases. The liver disease that a patient develops can become life-threatening and cause the patient to die. In some patients, the virus will lurk in the body of the patient for several weeks and then disappear. Medical scientists are still not sure exactly why this happens to some patients, but not to all of the patients who are exposed to and infected with the Hepatitis C virus. In older times, no cure was available for patients with Hepatitis C. Today; however, scientists have made several breakthroughs in the treatment of this disease. A new class of drugs, known as direct-acting antivirals, or DAAs, was introduced in 2010. These drugs act directly upon the virus that causes the Hepatitis C infection. While the use of DAAs may not be 100% effective in every single person treated with such medication, it is estimated that around 90% of those who follow treatment protocols are cured of the disease. The use of DAAs can also eliminate the need for treating the patient with a drug called interferon, which has been a common drug used among these patients for several years. Direct-acting antivirals are administered to a patient over the course of eight to 24 weeks, depending on certain factors, including how the virus that has infected them reacts to the medicine. It is important to note that these drugs produce fewer side-effects as compared to other drugs that were previously used in the treatment of Hepatitis C. Furthermore, doctors have discovered that DAAs can be used regardless of whether the patient has an acute or chronic stage of Hepatitis C.
Even though highly effective vaccines have been developed to assist with reducing the occurrence of Hepatitis A and B, no vaccine has yet been successfully developed for the prevention of Hepatitis C. This means individuals who are exposed to people already infected with this virus may be at a high-risk of being infected themselves in certain situations. This is why it is vital for individuals to know how the disease spreads. The virus cannot spread through the contact of saliva as many other viral infections tend to transmit from the infected toward the uninfected. Hepatitis C spreads through blood contact. Thus, by taking certain steps, the risk of being infected, even when in an area where the prevalence is considered high, can be effectively reduced. An important step to take is to avoid sharing needles or using a needle that has been used by another person – even at local clinics. Always ensure a new needle is used for anything that requires such a tool. It is also important to ensure any tattoo parlors utilized should be licensed and follow the correct procedures to ensure the safety of their clients. The sharing of needles in a tattoo parlor can also greatly increase a person’s risk of being infected. Hepatitis C is considered a serious infectious disease that can become fatal when appropriate measures are not taken early on. This poses a problem to the healthcare system as the disease is not likely to cause any particular symptoms in most patients infected with the virus. Frequent testing, especially among patients at risk, is required to ensure early detection of the virus in their bodies. This can ensure appropriate measures are taken to reduce the effects the viral infection may have on the patient’s liver. While no vaccine has been introduced for the prevention and immunization of Hepatitis C, travellers who may be visiting an area where the disease is more common are urged to educate themselves on the appropriate measures that can be taken to reduce their risk of exposure.